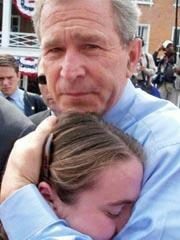 A viral photograph shows President George W. Bush hugging the daughter of a 9/11 victim. It started out as a fluke. Lynn Faulkner had been offered an extra ticket to a Bush campaign event by his neighbor Linda Prince. Mr. Faulkner decided to offer it to his 15-year old daughter Ashley who he expected would decline, as she would have to miss some school to attend. But his daughter surprised him. Ashley reminded her dad how four years ago they attended a similar event when then Texas Governor George W. Bush visited the same spot on the campaign trail. Ashley remembered attending that event with both her father and her mother Wendy Faulkner. It was raining that day and they all stood in the rain awaiting Governor Bush “eating Triscuit crackers” enjoying the time together and hoping to get a glimpse of the would-be president. Ashley recalled holding her mothers hand as they waited. So she decided to go again this year, but this time her mother could not attend. Wendy Faulkner was murdered on 9/11/01 in the south tower of the World Trade Center. She was there on the 104th floor for a one-day meeting. Ashley decided to miss school in honor and remembrance of her mother and attend the event. An editorial about the story behind the photograph can be found at the Washington Dispatch web site, which also includes a page of reader-submitted commentary about the story. The Cincinnati Enquirer. 6 May 2004. The Columbus Dispatch. 5 May 2004 (p. A1). The Columbus Dispatch. 9 May 2004 (p. B5). The Washington Dispatch. 10 May 2004. The Columbus Dispatch. 6 May 2004 (p. B8).